Tucson, Arizona is not the spot you often think of when you want great live fire cooking. It does not have the deep barbecue history of Texas, North Carolina, or Memphis, and does not have a history of fine dining and live fire experimentation found on the coasts. But, don’t pass by our fair city too fast…in 2015, Tucson was named the first UNESCO City of Gastronomy in the US. This designation was based on Tucson’s claim to the longest continuously cultivated community in the country, with the earliest evidence of agriculture dating back nearly 4000 years! Recently, Tucson chefs have started to develop new ways to utilize local Sonoran desert foods and techniques that are part of this history and have created a set of restaurants that has revitalized our food scene. 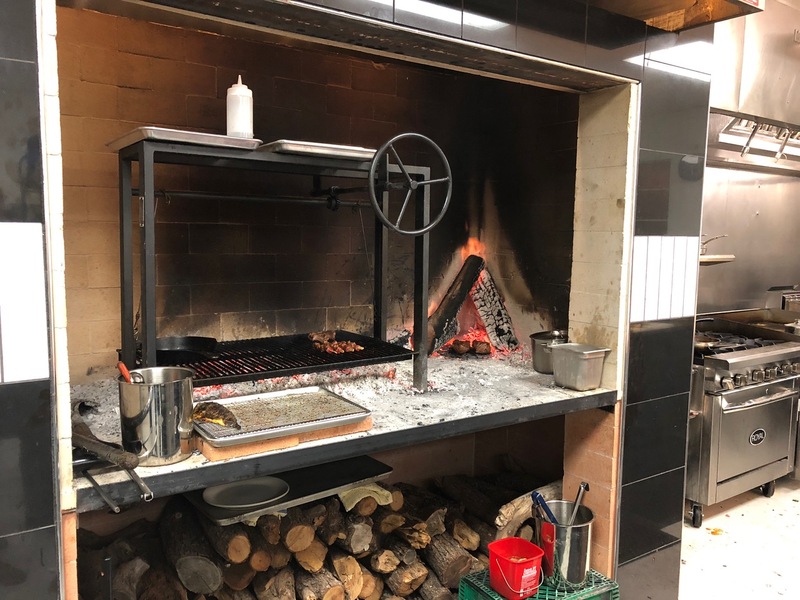 I provide this context as a way of introducing you to the newest player in town: Tito and Pep, a neighborhood bistro built around live-fire cooking. John Martinez opened Tito and Pep in November 2018 with his wife Nikki Berger Martinez. After nearly a decade working at a fine dining restaurants from New York to Scottsdale, John and Nikki came back to Tucson to bring their passion for fusing regional ingredients with new techniques to create a menu that reflects Tucson’s diverse cultural heritage, with a heavy Mexican influence. Not only is their food fantastic, but they are great, down-to-earth hosts. At my first dinner there, John came to every table to chat, and when I asked about his grill, he invited me straight back to the kitchen to talk shop and smell the mesquite. 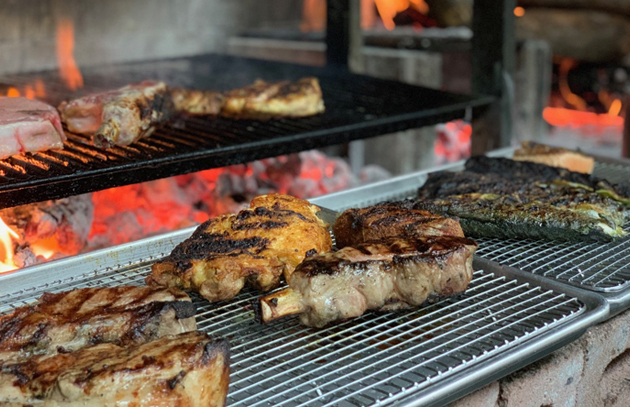 After I told cousin Steve (you know him as the guru of the grill, Steven Raichlen) about Tito and Pep, he asked me if I would be interested in telling you all on the Barbecue Bible blog about this gem. I jumped at the opportunity because I believe strongly that we need to do all that we can to support locally owned restaurants run by chefs that bring their passion to the table. 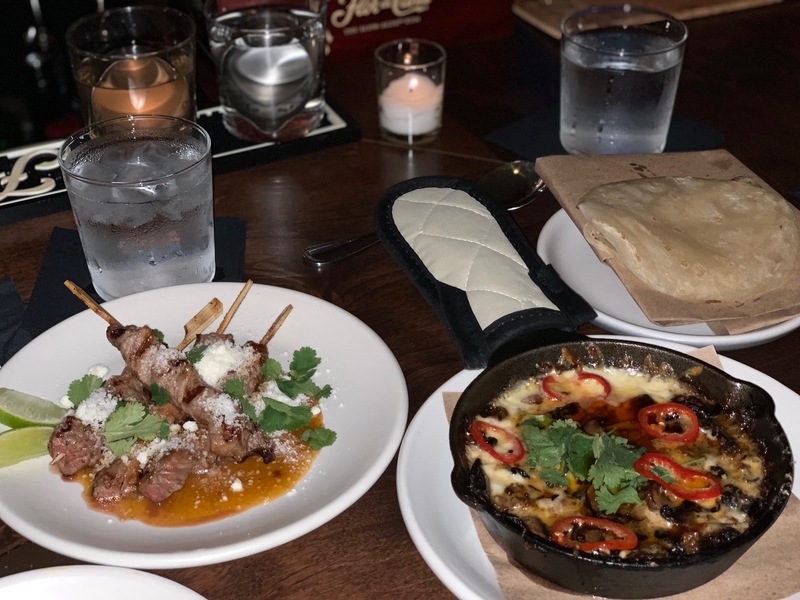 While not really a review of Tito and Pep, this post is more a description of the flavors and experience you can have if you are ever swinging through Tucson and find your way to their place. Most of the dishes at Tito and Pep either begin or end at their custom-made wood-burning grill. The rig was designed in Georgetown, TX but built in Arizona, filling part of a brick oven that holds in the heat and allows for a diverse set of techniques. 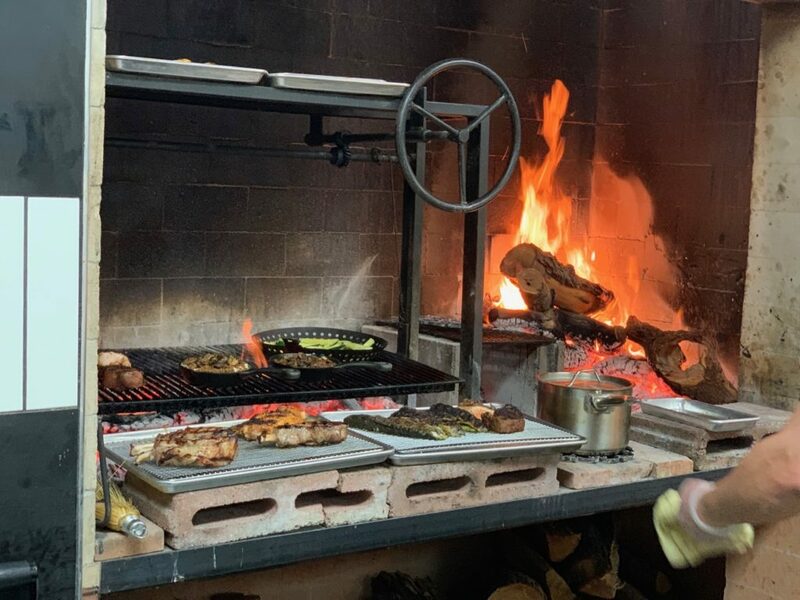 In addition to the grill, mesquite logs are set in the back of the oven-like space, and foods are cooked right up against the logs as they burn down in what John calls “The Inferno”. In fact, the heat is so intense that John keeps a bucket of ice water nearby so the staff can dip their hands and arms in before working the food. 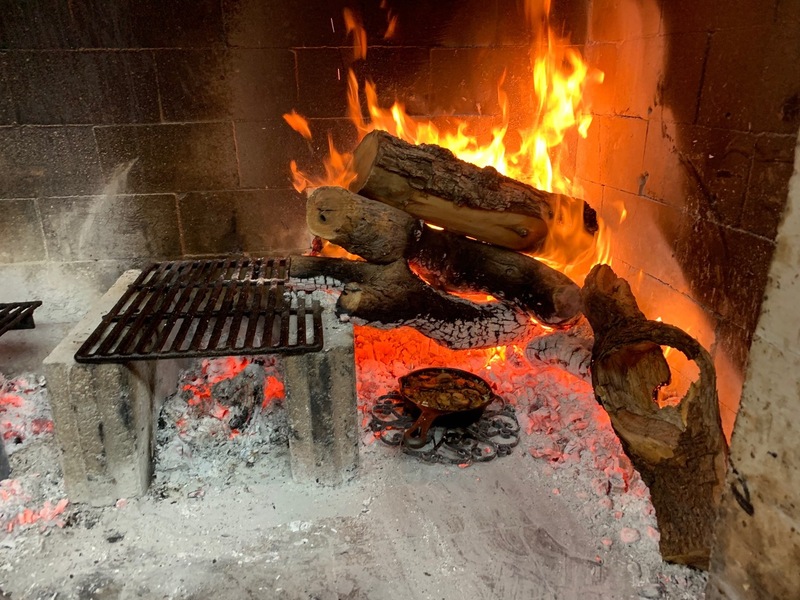 Once the logs burn down, the coals are raked under a grill that can be raised and lowered by a flywheel, and food can be set on top of the rig, high above the heat, so it can warm in a light cloud of smoke. Using this unique design, Chef John is able to control temperature and smoke so that all of his dishes are touched by mesquite, without overpowering the meal. Based on this design, John and his staff serve a suite of entrees grilled to perfection, including salmon, trout, chicken, lamb chops, and a NY strip. The steak starts its journey to the plate over red hot coals on the grill and then finishes in the Inferno to get a nice sizzle before service. This double whammy of mesquite doesn’t overtake the flavor of the steak, but perfectly complements the meatiness with a smoke flavor that you don’t get on a backyard grill. In addition to their other grilled meats, they go the extra step of charring chicken carcasses over the fire before making stock for sauces. This is the kind of attention to detail that sets the flavors at Tito and Pep apart. While most blog readers are interested in the main meat dishes, I want to draw your attention to an appetizer that could be a great addition to your repertoire. It’s called Queso Fundito, and is kind of like a Mexican fondue finished over fire and famous in the Chihuahua region of Mexico. This dish starts with house-made chorizo and sautéed mushrooms. They’re added, along with garlic, soy sauce, and Maggi spices, to a cast iron skillet and covered in queso menonita (cheese named after Mennonites in northern Mexico). The skillet is placed into the Inferno, and once the cheese is bubbling hot, the dish is served with warm tortillas. It is sumptuous, with loads of flavors packed into a small skillet. The soy sauce is a unique addition, but John let us know that it’s not so odd for this region. There was a lot of trade between Mexico and the Far East, with flavors passing back and forth for centuries. Growing up in Tucson, John brings this curiosity and knowledge of history to the table in inventive ways that keep you satisfied and ready to plan your next visit back. All in all, if you are ever in Tucson, stop by Tito and Pep. You won’t regret it. If you’re lucky, John will swing by your table and invite you back to see the grill. 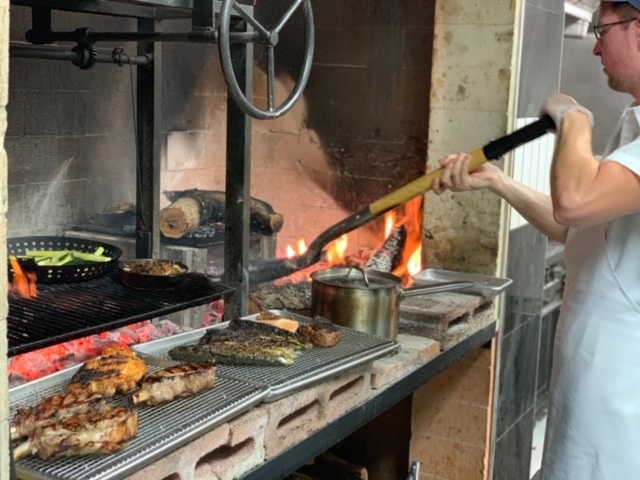 It’s an experience that you won’t get at many restaurants, and if you like live-fire cooking, which I assume you do if you are on this site, then Tito and Pep will not disappoint.